Grundfos, based in Denmark, is a global leader in water technology and the world’s largest pump manufacturer. With 19,000 employees spanning 80 countries, consistent communication is paramount to maintaining market dominance. 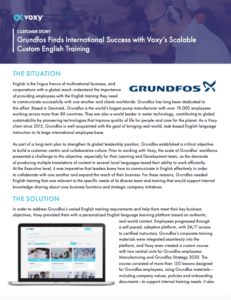 A Voxy client since 2015, Grundfos has experienced continued success by providing our task-based English language instruction to an extensive international employee base. Initially, though, they were faced with a significant challenge. The demands of producing multiple translations of content in several local languages taxed their ability to work efficiently. 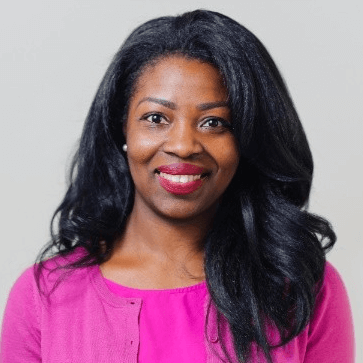 To help overcome this challenge, the company set an objective to build a customer-centric and collaborative culture. Achieving this objective meant Grundfos would need English training to address the needs of a diverse team. With Voxy, Grundfos’s corporate training materials were seamlessly integrated into the Voxy platform to offer task-basked English training aligned directly to employees’ jobs. The result? 87% of learners improved their English proficiency score. Read on to learn how Grundfos met key objectives through personalized and scalable English training to achieve continued international success.